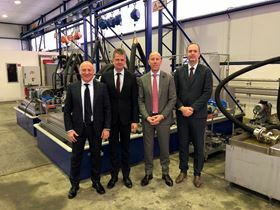 Left to right: Massimo Scapolo – GM Varisco’s customer centre; Maik Graumuller – owner of IPV; Adrian Ridge – president Power and Flow, Atlas Copco; and Wim Moors – VP marketing Flow, Atlas Copco. Dresden-based IPV had revenues of approximately €5 million (SEK50 million) in 2017 and has around 20 employees. IPV will become part of Atlas Copco’s Power and Flow division in the Power Technique business area. Atlas Copco acquired Italy’s Varisco in 2016.